Plaster is a common material for arts and crafts projects. Always lay a drop cloth under your workspace to prevent the plaster from drying on your concrete floor. Remove the plaster from concrete as soon as possible as the more the plaster dries and hardens; the harder it will be to remove. Use a mild acid to slowly dissolve the plaster without damaging the concrete. Different types of plaster have different strengths that affect the removal process. Remove as much of the plaster as possible by tapping it gently with a hammer. Plaster is softer than concrete so the concrete should not break if you are careful not to hit the concrete or the plaster very hard. Chip away any dried plaster using a chisel, but be careful not to scratch or chip the concrete. Remove as much of the plaster as possible, but it is unlikely you will be able to remove all of the plaster this way. Soak the remaining plaster residue with white vinegar. Pour the white vinegar directly on the plaster. Immediately cover the plaster with plastic wrap to help keep the white vinegar from drying. Check the plaster every few hours. If it dries, resoak it with white vinegar and cover it with the plastic wrap again. Continue soaking and reapplying vinegar until the plaster is soft enough to scrape off. Scrape the softened plaster from the concrete with a plastic paint scraper. 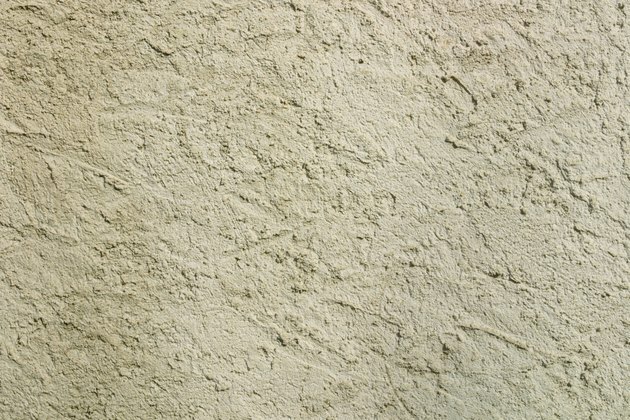 Scrub white vinegar into the concrete surface with a stiff-bristled scrubbing brush to ensure you have removed all of the plaster particles in the concrete's textured surface. Rinse the concrete with clear water. What Is Skim Coating for Concrete Ceilings?